This 16in x 16in foundation paper pieced mini quilt is perfect for Halloween lovers! Make it as a wall-hanging or pillow, or include it in a larger quilt. 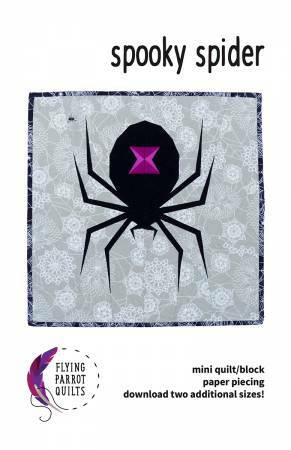 Customers will find a download code for two additional sizes of spider paper piecing templates inside the pattern. Knowledge of basic paper piecing techniques is assumed. All foundation paper piecing templates are provided on 8-1/2in x 11in paper for ease of copying.